A few months ago Dunrobin, near Ottawa, was devastated by a powerful tornado. This tornado significantly impacted the homes of two Westport natives: Sean McNally (son of Jean and Joe McNally) and Francis Kane (son of Pauline Kane). 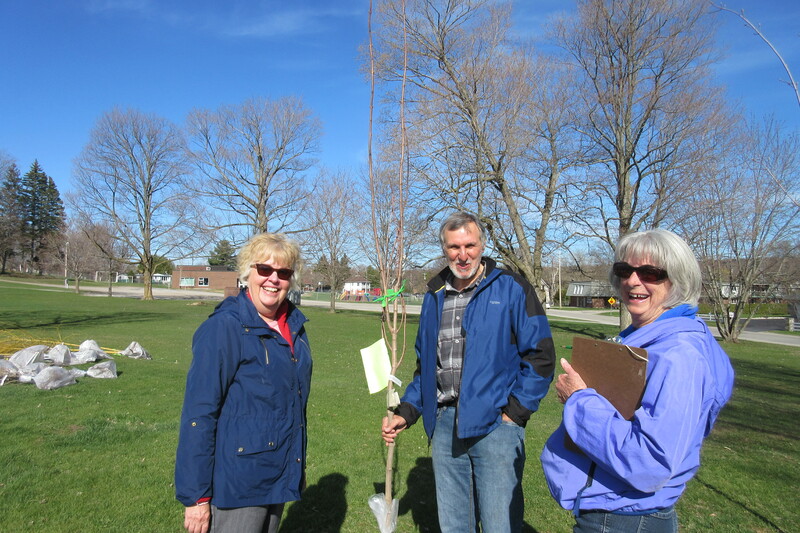 As a small gesture to aid in the rebuilding process, Westport In Bloom is donating each family a tree – a beautiful Baby Blue Spruce for the McNally family and a mighty Red Oak for the Kanes. Happy holidays to the McNally and the Kane families from the Village of Westport. We are thrilled to launch our 13th Annual Tree Sale – just in time for the holiday gift giving season!! We’ve got almost 40 varieties of fruit trees, shade trees, flowering trees and shrubs as well as evergreens. Each variety was carefully selected for their ability to thrive in our part of the country. 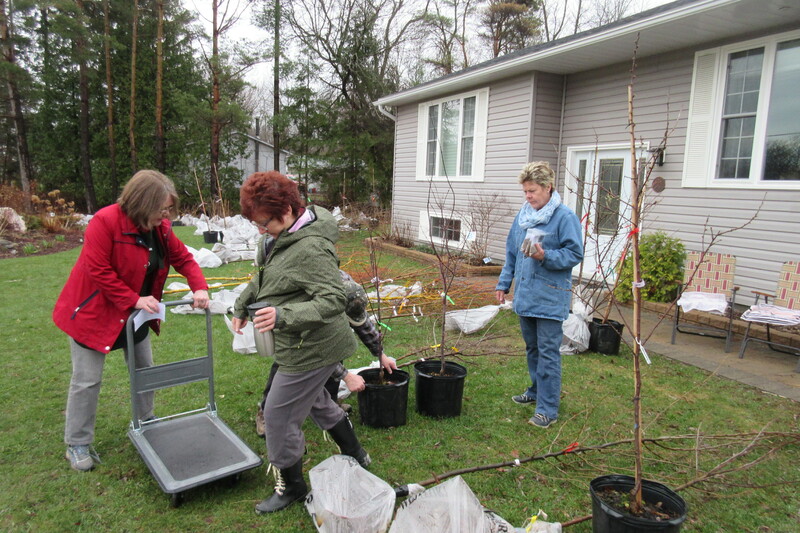 Most of our trees are at least 7 – 8 feet tall and are bareroot so they are easy to carry and plant. All of our trees include MYKE (a root stimulant), planting instructions and are between $35 and $90. AND there’s NO TAX! Every penny earned goes towards the beautification of Westport – our hanging baskets, planters, benches, gardens, holiday swag and more. See our TREE and FAQ pages for our catalogue and ordering info. You can also email janette.elaine.auer@gmail.com or message us for a catalogue and ordering information. Thanksgiving is over but Westport in Bloom continues to feel thankful for the wonderful flowers we’ve had this year, and STILL have! But while we feel that our flowers have been magnificent all summer, it’s still pretty hard to compete with Mother Nature! Flowers! Flowers! Flowers! They’re here and they’re beautiful! Enormous thanks to our new grower, Klaas Van Der Meer, from Green Acres Greenhouses – Westport in Bloom is celebrating today! Hurray for Westport in Bloom elves Barb Weir and Delvalle Lewis and Janette Auer, who picked out and picked up the flowers for Westport’s sign gardens and the Town Hall and the library at Soho’s today, and then have probably planted them to boot (I certainly saw Delvalle hard at work ALL afternoon at the Town Hall) – and for Donna Easter, who has uncomplainingly let me rummage around her garage for the past two days, getting the banners organized, despite all the activity going on in her own life, and for Debbie and Malcolm Bird, who have gotten our errant banner hardware taken down and drilled and delivered to its temporary custodian (me, so I KNOW whereof I speak), and for Jacky Brady, who has arranged for the village’s shiny new Public Works Department to hang said banners, and once again for Barb Weir, who has gotten everything all organized for our planters and baskets to go out just as our banners are being hung, probably within the next week – and suddenly it will be summer and dazzlingly colourful and everything the heart could wish for – SOON!!!! Hurray! Getting all our hardware organized for this summer’s Banner Season! Hmm, wait a minute – right-handed BJ MacDougall is using her left hand, and left-handed Janette Auer is using her right. We clearly need somebody to organize US! Elsewhere in town, Bloomer Elves Deb and Malcolm Bird, Barb and Bob Weir, and Delvalle Lewis and David Church were improving the golden hours in similar fashion (and maybe even using their dominant hands to do it). And the Grand Tree Distribution Lallapalooza is DONE! After two more days of fetching and carrying and LOTS more counting and checking, (nearly) all of our 320 trees are now safe and happy in their new homes. A great way to wrap up Earth Week: we’re calling it the Greening of the Greater Westport Area! Oh, boy, do we know how to have fun! 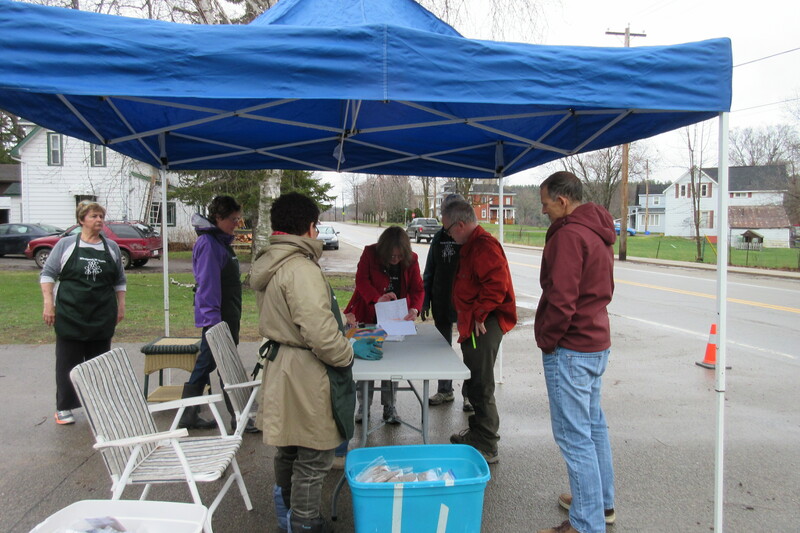 We spent the day in all that cold, wet rain, unloading, counting, sorting, counting, labelling, counting, bagging, counting, watering, counting and storing our trees for the big day – Tree Pick-Up on Saturday! And did a magnificent job of it too, if we do say so ourselves – thanks to the hard work and unfailing good cheer of all the usual suspects: Bloomers Janette Auer, Debbie Bird, Jackalyn Brady, Donna Easter, Carolyn Green, Delvalle Lewis, Betty Jo MacDougall, Ruth Pedherney, Margot Rothwell and Barb Weir; husbands David Church and Bob Weir; friends Anna and Nigel Chadwick, John Boyle, Jill and Don Cooke, Gail and Mike Fay, Mike McIntyre and Candy Stothart; and generous neighbour Cheryl Hanna. What a great group, what a great village, what a good day! THEY’RE COMING! 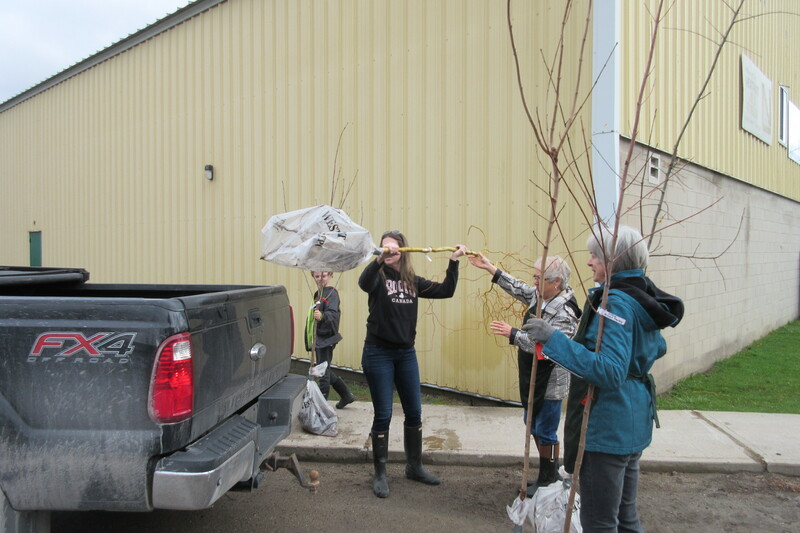 On Saturday, April 28 the trees you’ve ordered will be ready for pickup at 32 Concession Street (across from the arena), 9 am to noon. What a good way to celebrate Earth Week! Thank you, Westport, and see you there! Drumroll, please…. today Westport in Bloom volunteers Barb Weir, Janette Auer and Betty Jo MacDougall put together all the little bits and pieces that make up the insides of our planters, which means that our flowers for this summer can be planted within the next few days. We hereby declare it Spring! 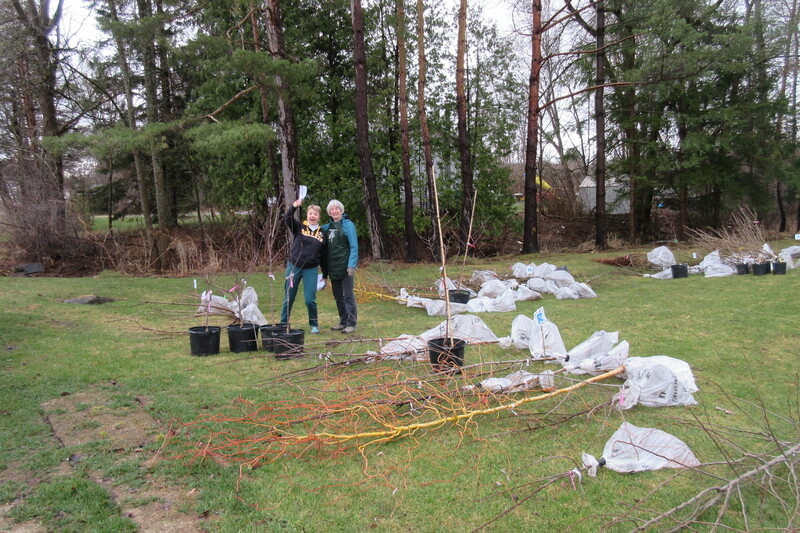 Westport in Bloom’s great big annual tree sale is virtually cleaned out – just 1 oak, 1 willow and 5 pears left! However, we still have a number of trees that have been ordered but not paid for, so if there’s something you’ve been longing for, let us know and we’ll put your name on the waiting list in case those orphans go unclaimed. Check the list of what we’ve been offering under TREES, then contact janette.elaine.auer@gmail.com or 613-273-6079, and she’ll take care of everything. And thanks, everybody, for the great support! If you’re hoping to add a pear tree to your garden this spring, now’s the time to order – Westport in Bloom’s tree sale has only a few left! Bartlett and Flemish Beauty are two of the world’s favourites: beautiful blossoms followed by large, sweet, juicy pears, on productive, cold-hardy trees. Both are partially self-fertile but, like most fruit trees, will produce an even better crop when cross-pollinated with another variety. Seven feet tall and only $60, tax-free, they’re bareroot for easy handling, and will arrive in Westport in late April, just in time for planting season. 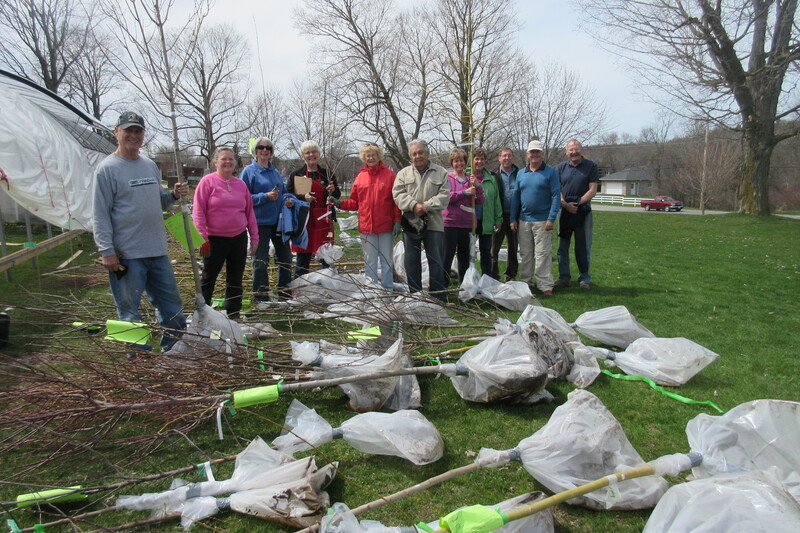 Lots more shade trees and flowering trees available too, most under $85 – check out our full line-up at westportinbloom.com under TREES, and contact Janette at janette.elaine.auer@gmail.com or 613-273-8760 to place your order. But act soon – they’re going fast! What’s Spring without a crabapple tree in full bloom outside your window? And Westport in Bloom’s tree sale has two beautiful choices this year – both 7 feet tall and $70 each. Dolgo’s shell pink buds open early in the season to an explosion of fragrant, self-pollinating white blooms that last for weeks. The brilliant crimson fruit is sweeter and larger than other crabapples – about the size of small plums – and are not only excellent in pies, jam, jellies and cider but can even be eaten fresh. Profusion is another spectacular variety, particularly in Spring, when its intense red buds open into 1.5 inch blossoms and blanket the tree with a long-lasting splash of vibrant hot pink. And for even more colour, its half-inch ruby-red fruits persist well into winter. Either crabapple will make an exceptional decorative tree for your yard. Beautiful blossoms in the spring, glossy green foliage in the summer, tart colourful fruit that remains on the tree through the fall and winter, excellent at pollinating other apple trees, cold-hardy, disease-resistant, useful for windbreaks and a source of food for wildlife…everything you could want in a landscape tree! We have lots more shade trees, fruit trees and flowering trees and shrubs available too – most of them a good 7 feet tall, but bareroot, so they’re light to carry and easy to plant. And they’re all chosen for their ability to thrive in Zone 5 (our part of the country) or even colder. Nearly all are priced between $45 and $85, tax-free, and every penny goes back into our community. Check out our full line-up at westportinbloom.com under TREES, and contact Janette at janette.elaine.auer@gmail.com or 613-273-8760 to place your order for April delivery. But act soon – they’re going fast, and we expect to be shutting down in a few weeks! Westport in Bloom Tree Sale: Japanese Maples are easily one of the most beautiful trees you can buy and Emperor One Japanese Maple is the cream of the crop! Fast-growing, vigorous, and one of the hardiest red-leaf Japanese maples available, this exceptionally ornamental tree displays gorgeous colour throughout the year, from rich plum purple to brilliant crimson red, and leafs out late enough to avoid spring frost damage. Its beautiful leaves are not only exquisitely shaped and colored, but almost translucent, glowing from the inside like a lamp when the sun hits them. You have to see it to believe it, and once you do, you won’t forget it. Grows quickly to 15-20 feet tall and wide, perfect for small spaces, but can be pruned to any size. Lots of other shade trees, fruit trees and flowering trees and shrubs available too – most of them a good 7 feet tall, but bareroot, so they’re light to carry and easy to plant – and all chosen for their ability to thrive in Zone 5 (our part of the country) or even colder. Nearly all are priced between $45 and $85, tax-free, and every penny goes back into our community. Check out our full line-up at westportinbloom.com under TREES, and contact Janette at janette.elaine.auer@gmail.com or 613-273-8760 to place your order for April delivery. But act soon – they’re going fast! How about growing a bit of history on your own land? One of our favourite selections this year are saplings grown from seeds collected from the Comfort Maple, believed to be over 500 years old and considered the oldest and finest sugar maple in Canada. This spectacular tree, named for the family who owned the land on which it stands for 150 years before donating it to the Niagara Peninsula Conservation Authority in 1961, stands over 80 feet tall, has a trunk over 20 feet in circumference, and was growing when Columbus arrived in America. Now, those are good genes! Our babies – its babies – are already a good 7 feet tall and you can take one home for a flat $80. Maple syrup in the spring, a beautiful shade tree in the heat of summer, and a dazzling display of red, orange and yellow in the fall, in addition to all that history. What’s not to like? Lots of other shade trees, fruit trees and flowering trees and shrubs available too – nearly all priced between $45 and $85, tax-free, every penny of which goes back into our community. Check out our full line-up at westportinbloom.com under TREES, and contact Janette at janette.elaine.auer@gmail.com or 613-273-8760 to place your order for April delivery. But sooner rather than later – they’re going fast! Here’s a New Year’s resolution that will warm up your winter with dreams of Spring, and make the world a little bit greener in the bargain: plan to plant a tree! 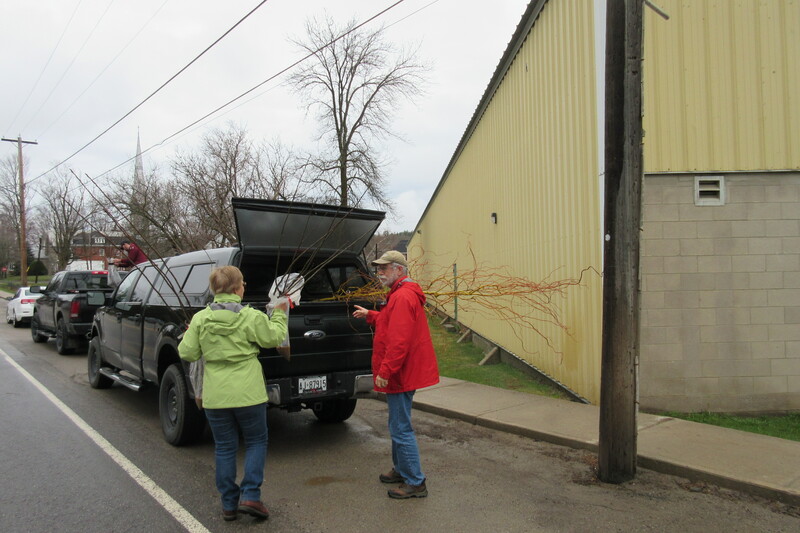 Westport in Bloom’s tree sale is still in full swing, with fruit trees, shade trees, flowering trees and shrubs – most of them at least 7 feet tall, but bareroot, so they’re easy to carry and plant, and chosen for their ability to thrive in our part of the country. Great prices too – nearly all are between $45 and $85, including Myke root stimulant, and there’s no tax. Plus, because we’re non-profit, every penny we earn goes directly back into the community. We’ll be taking orders till the end of February (or until we sell out, probably well before that – they’re going fast!) 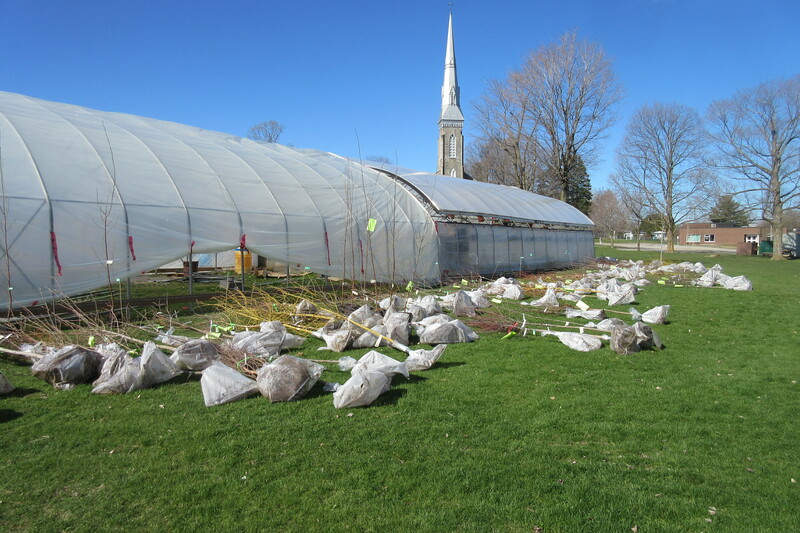 and the trees will arrive at the end of April, just in time for planting season. Check out our full collection under TREES, or message us for a catalogue and ordering information, then contact Janette at janette.elaine.auer@gmail.com or 613-273-8760 to place your order. And Happy New Year from all of us! Merry Christmas, Happy New Year and THANK YOU to all the elves who have helped with Westport in Bloom’s efforts to keep our village beautiful this year! Thanks to all the folks at the Town Hall – Robin Jones and all the members of Council, along with Scott Bryce, Paul Snider, Nikki Bresee, Patti Mueller and Anne-Marie Koiner – for their constant support and cheerful willingness to sign legal documents on our behalf; to Ken Rose of the Westport and Rideau Lakes Chamber of Commerce, Christine Janeway of the Rideau District Museum, Ruth Pedherney of the Westport Public Library Board and Angela Elster of the Westport Arts Council for the letters of support that helped us win a Canada 150 grant for our beautiful new banners; to the teachers and staff at Rideau Vista and St. Edward’s Schools, for their assistance in getting the banner project underway; to the students who created the spectacular artwork involved; to our favourite artist, Francie Healy, who put it all together into the beautiful banners that have brightened our streets this year; to Bob Popma, Ray Smith and Rick Gresik of the Odd Job Squad for fearlessly climbing ladders, often in heavy traffic, to hang all those banners in the spring and remove them again in the fall; to Mike McIntyre, Pete Stothart and John Boyle for their muscular assistance in wrangling trees for our annual tree sale; to Howie Crichton, for locating rental trucks to transport our trees and lending us Soho’s lawn to distribute them; to Kyle Kudrinko, who helped me check the placement of our planters around town; to Elizabeth Hess and her crew, for their excellent care of the flowers in our planters and hanging baskets; and to all the wonderful people in Westport and the GWA (Greater Westport Area) who’ve helped make all our gardens and baskets and planters and banners and swags possible by sponsoring memorial planters and supporting our annual tree sale. Special thanks as well to our long-suffering husbands, Malcolm Bird, Don Cooke, David Church, Duncan MacDougall, Pete Stothart and Bob Weir, who build planters, repair equipment, drive trucks and haul all the heavy loads for us, and keep us laughing in between times. And finally, a great big hug from Your Faithful Secretary, Betty Jo MacDougall, to all the wonderful women who make Westport in Bloom such a joy to be part of: Janette Auer, Debbie Bird, Jackalyn Brady, Pat Brown, Anna Chadwick, Jill Cooke, Eileen Dunleavy, Donna Easter, Carolyn Green, Delvalle Lewis, Ruth Pedherney, Marianne Roberts, Margot Rothwell, Candy Stothart and Barb Weir. Thank you, everybody, and Merry Christmas! Apple lover? You’re in luck – good fruit trees are often hard to find in nurseries, but Westport in Bloom has a great selection in this year’s tree sale. Honeycrisp is one of the sweetest apples on the market, extremely juicy and explosively crisp, great for eating fresh and for cooking too, but often expensive or hard to find, because it’s in such short supply. Once you try a Honeycrisp (bottom right), you’ll know why it’s everybody’s favourite! Other top picks include Ambrosia (top left), an intensely sweet, low-acid modern variety discovered in BC in the early 1990s, possibly as an accidental cross of Delicious parents; Royal Gala (bottom left), considered one of the world’s best eating apples; and the ever-popular all-purpose McIntosh (top right), a very cold-hardy native of eastern Ontario, first grown near Morrisburg in 1811. Prices range from $50 to $65 for easy-to-plant bareroot trees up to 7 feet tall. We’ll be taking orders till the end of February (or until we sell out, probably well before that!) and the trees will arrive at the end of April, just in time for planting season. Check out our full collection under TREES, email janette.elaine.auer@gmail.com or message us for a catalogue and ordering information. Looking for a great Christmas gift? How about the promise of a tree from Westport in Bloom? Pick one out now, while supplies last – we’ll send you a card announcing your gift, and the tree will be delivered to Westport in late April, just in time for planting. We’ve got fruit trees, shade trees, flowering trees and shrubs – most of them at least 7 feet tall, but bareroot, so they’re easy to carry and plant, and chosen for their ability to thrive in our part of the country. Nearly all are between $45 and $85, including Myke root stimulant, and there’s no tax. Plus every penny we earn goes back into making Westport beautiful. It’s more than a great gift for someone special (or for yourself!) – it’s a gift for our community and the environment too! Check them out under TREES, email janette.elaine.auer@gmail.com or message us for a catalogue and ordering information. We’re back! Westport in Bloom’s 12th annual Tree Sale is now officially up and running, and we think it’s going to be our best yet. We’ve got a great selection of old favourites: apples and pears and maples and flowering crabs; and some terrific new additions: cherries bred to withstand Canadian winters, a Japanese maple, a ruby red horsechestnut; and lots more. They’re all beautiful and big – most of them at least 7 feet tall, but bareroot, so they’re light to carry and easy to plant. And they’re all chosen for their ability to thrive in Zone 5 (our part of the country) or even colder. Great prices too – virtually all sell for between $45 and $85, with no tax. And every penny we make goes directly back into the community! We’ll be taking orders till the end of February (or until we sell out) and the trees will arrive at the end of April, just in time for planting season. Visit https://westportinbloom.com/trees-3/ for photos, descriptions and prices, and pick your favourite. The promise of a tree makes a great Christmas present too! Westport’s Santa Claus parade today …. no wonder Westport in Bloom has so much fun – we’re being watched over by angels! Ready or not – it must be Christmas! Westport in Bloom elves Carolyn Green, Delvalle Lewis, Barb Weir, Donna Easter, Debbie Bird and Betty Jo MacDougall were hard at work today creating and hanging swags all around the downtown core. Thanks to Mary Beaudoin at Ridgecraft for the greenery and good company! Getting excited! We’re just finalizing the lists of the trees we’re going to have available for our 2018 Tree Sale, which gets underway early this year, on December 1. Promise a tree this Christmas, and you’re not only giving a great gift but wrapping it up in dreams of springtime. Blossoms, shade, fruit, fall colour – we’ve got something for everybody. Stay tuned! Well, Westport in Bloom’s flower baskets and planters and gardens have been put to bed for the winter, and our beautiful new Canada 150 banners have been taken down (thanks to our good friends Bob Popma and Rick Gresik of the Odd Job Squad) – summer, alas, must be over. But the party isn’t over yet! Already we’re working on our Christmas street decorations, AND our shiny new and improved tree sale should get underway within the next month – keep us in mind for Christmas giving! Another crisis averted: In case anyone noticed Westport in Bloom’s detached banner bracket across the street from the Post Office, fear not, it has been repaired by the dauntless Malcolm Bird, who has been called on so often, along with his loyal sidekick David Church, that he has been forced to come up with a new business card! Two days ago, one of our memorial planters was the victim of a hit-and-run accident; today we’re delighted to report that it has been rebuilt, replanted and replaced on the street. Thanks to Debbie and Malcolm Bird for the TLC! So many reasons for Westport in Bloom to say “Thank you” to CIBC! Three years ago they funded a bench at the Post Office to commemorate the 70th anniversary of D-Day, and this past year their grant enabled us to develop experimental prototypes for our beautiful brand new self-watering planters all through the village. Encouraging us all to remember those who sacrificed for our country and at the same time making our world more beautiful and comfortable – what an excellent legacy! Hats off to the CIBC. Today was such a Banner Day! Thanks to everyone who came out to celebrate Westport in Bloom’s colourful new banners, particularly the students from St Ed’s and Rideau Vista who designed them, and Francie Roberts, who made them real. Our gratitude too to the Government of Canada for their financial support. And thanks to the Odd Job Squad, the banners will start appearing on our streets tonight. Happy summer, everybody, et bonne fête, Canada! Don’t forget – tomorrow we celebrate! Join Westport in Bloom at the Town Hall, Monday, June 5 at 1 pm, as we unveil some of the bright and beautiful new street banners designed by our very own students from St Ed’s and Rideau Vista to reflect their pride in our country as we mark Canada’s Sesquicentennial. This project has been made possible in part by the Government of Canada. Happy birthday, Canada! N’oubliez pas! Demain, le 5 juin à 13 h, à l’hôtel de ville, le comité Westport in Bloom va dévoiler nos nouvelles bannières de rue, dessinées par les élèves des écoles Rideau Vista et St Edward pour démontrer la fierté que leur inspire notre pays alors que nous célébrons le 150e anniversaire de la Confédération. Venez célébrer avec nous! Ce projet a été rendu possible en partie par le gouvernement du Canada. Bonne fête, Canada! As we’re sure you know, Westport in Bloom placed a full set of brand new planters all around the village just yesterday, and we love them – we think they look great, and they’re going to be so much easier for all us little old ladies to handle! But already we’re getting worried: just today we’ve seen people removing the recycled water bottles that serve as funnels to the water storage reservoir (and we NEED them!) and we’ve seen people sitting on the edges of the planters (and they’re NOT anywhere near strong enough for that!). So can we ask for everyone’s help in gently reminding anyone you see mishandling our planters to please please please treat them with respect and TLC? Thank you, Westport! Abby Road, Westport style! 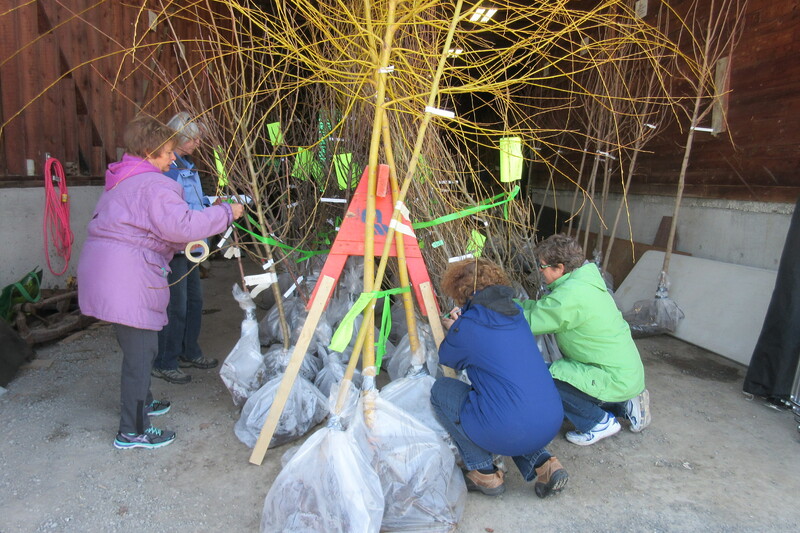 Westport in Bloom volunteers Debbie Bird, Barb Weir, Delvalle Lewis and Bob Weir celebrate the Hanging of the Baskets this afternoon, with a little help from our friends! And as Creative Gardens staffer Steve Close noted, after driving us around the village to deliver the baskets, “So I spend the day driving around in the sun, with a truck full of beautiful women, delivering flowers. Life is good!” Gotta love living in Westport. Westport in Bloom’s summer planters are out on the streets! Enormous thanks to the Blooms husbands who built the beautiful new planters over the winter, Elizabeth Hess, who supplied the flowers and whose crew is already hard at work watering them, and Debbie Bird and Barb Weir, who organized the logistics of the operation – and special thanks to Kyle Kudrinko for his muscular assistance and enthusiasm in helping me make sure all the planters were turned around in the right direction! A BANNER DAY IN WESTPORT! Join Westport in Bloom at the Town Hall on Monday, June 5 at 1 pm for a community celebration! We’re going to be ushering in Canada’s Sesquicentennial Summer by unveiling a brand new set of bright and beautiful street banners, designed by our very own school children at Rideau Vista and St. Edward’s to reflect their pride in our country. Come celebrate with us! For more information please continue to visit westportinbloom.com or contact bjmacdougall@gmail.com. This project has been made possible in part by the Government of Canada. Happy birthday, Canada! Joignez-vous au comité Westport in Bloom le 5 juin à 13 h pour une célébration communautaire! Nous allons fêter le sesquicentenaire du Canada en dévoilant une toute nouvelle série de bannières vives et colorées, dessinées par nos élèves aux écoles Rideau Vista et St Edward pour démontrer la fierté que leur inspire notre pays. Venez célébrer avec nous! Pour plus d’information, veuillez continuer à visiter westportinbloom.com ou rejoindre bjmacdougall@gmail.com. Ce projet a été rendu possible en partie par le gouvernement du Canada. Bonne fête, Canada ! 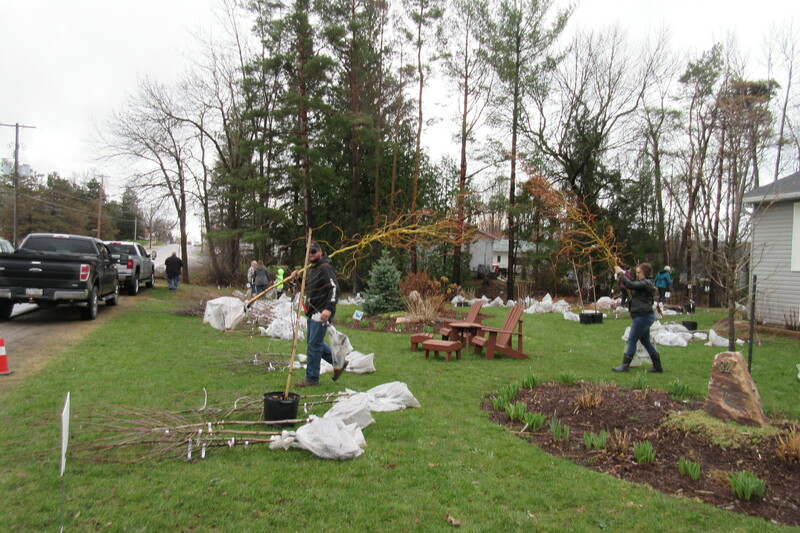 Whew – we’ve just completed one of our biggest events of the year – Tree Pickup Weekend! Thanks to our own incredibly hard-working and ever-cheerful crew – Jacky Brady, Janette Auer, Debbie Bird, Anna Chadwick, Jill Cooke, Eileen Dunleavy, Donna Easter, Carolyn Green, Delvalle Lewis, BJ MacDougall. 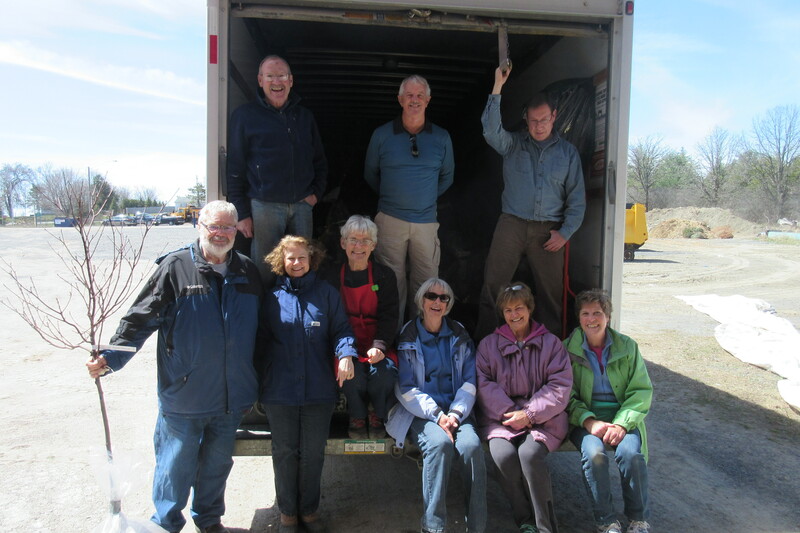 Margot Rothwell, Candy Stothart and Barb Weir – plus the driving skills and muscle of our good-looking and equally cheerful gentlemen volunteers – John Boyle, Mike McIntyre, Pete Stothart and Bob Weir – we sorted, labelled, loaded, transported, unloaded, alphabetized and distributed 350 big beautiful trees! Thanks too to all our customers – besides beautifying your own property, you’ve made it possible for us to provide a summer’s worth of flowers for Westport AND helped in the fight to protect our planet’s environment. I’d say that’s a good weekend’s work for all concerned! Janette and Donna (and maybe Carolyn?) sort through the jungle for our trees…. And everything in alphabetical order! Happy customers – just what we like! Margot, Jacky, Donna, Anna and Eileen – happy crew too! February 23, 2017: We are so proud of our young artists, their teachers and our volunteers, all of whom are working hard to help us produce a whole new set of street banners to celebrate Canada’s 150th birthday this year. Watch for them in June! Funding is provided by a generous grant from Heritage Canada’s Canada 150 Fund. Nous sommes énormément fières de nos jeunes artistes, leurs enseignants and nos bénévoles, qui travaillent fort pour nous aider à produire une toute nouvelle série de bannières de rue pour célébrer le 150e anniversaire du Canada cette année. Elles seront prêtes et installées en juin, grâce à une généreuse subvention du Fonds Canada 150 du Ministère du Patrimoine canadien. February 20, 2017: Remember all our cheerful Christmas swags and planters? They’re gone .. the party’s officially over! Can Spring be far behind??? Happy 150th birthday, Canada! Westport in Bloom is excited to announce that, thanks to a generous grant from the Government of Canada, we’ll be celebrating Canada’s Sesquicentennial this summer with a brand new set of street banners, to be designed by our own schoolkids from Rideau Vista and St Ed’s! But we need your help. The banners are meant to illustrate some of the many reasons we have to be proud of Canada and Canadians, and we want to hear your suggestions. Let us know why YOU are proud of our country, by commenting here or contacting us at westportinbloom@gmail.com. Thanks to everyone, and to the Canada 150 Fund! Bonne fête, Canada! Le comité Westport in Bloom est très heureux d’annoncer que, grâce à une généreuse subvention du gouvernement du Canada, nous allons célébrer le 150e anniversaire de la Confédération cet été avec une toute nouvelle série de bannières de rue, qui seront dessinées par nos élèves aux écoles Rideau Vista et St Edward! Mais il nous faudra votre aide. Les bannières doivent illustrer quelques-unes des raisons pour lesquelles on peut être fier du Canada et des Canadiens, et nous voulons entendre vos suggestions. Dites-nous pourquoi vous êtes fier de notre pays, en commentant ici ou en écrivant à westportinbloom@gmail.com. Merci à tout le monde, et merci au Fonds Canada 150! November 23, 2016: The elves are back at it today! Janette Auer, Barb Weir and Betty Jo MacDougall entertained themselves filling Westport in Bloom’s planters with Christmas greenery along the streets of the village and at the library and Town Hall. November 22, 2016: It’s beginning to look a lot like Christmas! Westport in Bloom volunteers Debbie Bird, Barb Weir, Jacky Brady, Delvalle Lewis, Betty Jo MacDougall, Donna Easter and Candy Stothart celebrated the first snowfall of the season by collecting truckloads of greens and berries, making them into big fat beautiful Christmas swags and hanging them all around town (oooh, cold fingers, folks!). Thanks too to Mary Beaudoin of Ridgecraft for hosting and advising! October 12, 2016: Bloomer Girls Debbie Bird and Delvalle Lewis have taken down this year’s baskets after an incredibly difficult drought year – it breaks our heart to see the flowers go, but are these fabulous women, or what??? But hold on to your hats: next year’s sesquicentennial flowers are going to be The Best Ever!!! Westport in Bloom’s Bloomer Girls are delighted to report that our very own Debbie Bird and her faithful sidekick Malcolm are the newest recipients of Westport Village Council’s Volunteer of the Month Award. We are so pleased to have the village recognize what we already knew: we simply could not get along without Debbie and Malcolm. They handle all our mechanical issues, figure out what kind of pumps and trailers and come-alongs and every other kind of mechanical device imaginable that we need, find sources for us to acquire them and then operate and maintain them to boot. In their off hours, they haul all our heavy planter boxes around town, scrape and stain them, and store them for the winter in what would otherwise be their own carport and garage. They drive big trucks and trailers around the country when we need big trucks and trailers driven (and they know how to back the trailers up too), they hang baskets, swags and banners, paint garbage cans and decorate floats (and their long-suffering dog Murphy) for the Santa Claus parade. Debbie also serves as our treasurer, and actually makes it clear to our not-particularly-financially-savvy minds where the money is coming from and where it is going. She and Malcolm invent stuff to make our lives simpler, give us sound logical advice on all the issues confronting us, entertain us in fine style whenever we are in need of social interaction and, when nothing else is going on, Debbie helps build flowering blue jeans to delight and entertain the whole village. We think they are absolutely wonderful, and we couldn’t be prouder of our very own Volunteers of the Month. Volunteers of the Century is probably closer to the truth. Hurray for Debbie and Malcolm! June 3, 2016: Westport in Bloom’s baskets are up and summer begins! Thanks to all the usual suspects: Malcolm & Debbie Bird, Donna & Bill Garland, Duncan & BJ MacDougall, Delvalle Lewis, Janette Auer, Donna Easter, Jacky Brady, Barb Weir and Candy Stothart. May 30, 2016: We did it! Today we got something like forty memorial planters planted and moved out onto the street to make our village even more beautiful for the summer! We also planted boxes at the library and gardens at the village hall, and donated flowers for the Chamber of Commerce garden. Hard-working Westport in Bloom volunteers include Janette Auer, Jacky Brady, Debbie Bird, Barb Weir, Candy Stothart, Delvalle Lewis, Donna Easter, Donna Garland, Ruth Pedherney and Betty Jo MacDougall (plus John Dunn from the new antique shop on Spring Street), with help and support, as always, from the magnificent Elizabeth Hess and her crew. And later this week we’ll be planting the gardens at the town signs and hanging baskets of flowers! May 25, 2016: Yet more muscle power in the service of beauty! This morning, Westport in Bloom volunteers Candy Stothart, Barb Weir, Delvalle Lewis, Jacky Brady, Ruth Pedherney, Betty Jo MacDougall, Janette Auer, Debbie Bird and Donna Easter put together all our planter boxes and got them filled with beautiful new soil by the sweat of our brow, with the invaluable assistance of Elizabeth Hess at Creative Gardens. Next week we plant, and then summer breaks out! May 20, 2016: Westport in Bloom’s muscle strikes again! Debbie Bird, her son Mike, and Duncan MacDougall spent the morning moving all our VERY heavy planter boxes out onto the street for the summer. Thanks, guys, you’re the best! Now all we have to do is scrub them up, attach new memorial plaques, clean out the masses of garbage they inexplicably collect and then fill them with flowers – soon!!! May 2, 2016: Our Tenth Annual Tree Sale has just wrapped up – and it was the best ever! Our peerless and fearless fetchers and carriers and packers fetched and carried and packed them all! The final result: trees, alphabetically arranged, as far as the eye can see, and well beyond! And then the high point: our first customer pick-up of the day (Gail and Mike Fay, greeted by Candy Stothart), and the first of the many big smiles that made the day super-special. And thank you for helping us keep Westport beautiful!